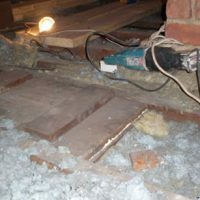 Lack of knowledge of the exact location of asbestos has always been a problem. If you are unsure, click on the diagram below will show you the typical locations for the most common asbestos-containing materials. Asbestos water tanks in the loft are common in many older British homes. They are likely to have been constructed with asbestos if they were in houses that were constructed before 2000. Disturbed fibres from the water tank from drilling or piping work can cause fibres to be disturbed and made airborne. Asbestos water tanks usually have around 5-10% asbestos content, and is non-friable. This means that asbestos fibres in the water tank are tightly bound together with cement and cannot be easily crushed by hand. What do you consider the likely locations of asbestos? Pipe lagging is mostly found in or on heating systems such as around boilers or calorifiers and around pipework. This type of asbestos has many different appearances but is mostly a fibrous material which flakes and powders easily. When applied to pipes it is often covered in a protective coating (or painted) which can be any colour, and may make it more difficult to identify. This was used to insulate industrial and domestic premises so can be found in between cavity walls, under floorboards and in loft spaces. This is a loose, fluffy insulation material (similar to candyfloss), which may be blue-grey or whitish in colour. Probably the most dangerous asbestos-containing material. Loose fill is made up of pure asbestos and if disturbed can release large amounts of fibres into the air, where they can be breathed in. Textured coatings were used to produce decorative finishes on ceilings and walls. In the past, they have had various trade names such as ‘Artex’. Their look is dependent on the particular decorative finish required ie peaks or patterns. They are hard and were originally white in colour but have often been painted over. Work on any type of asbestos can be dangerous. However, work on textured coatings can be carried out by non-licensed workers who are appropriately trained. This work would generally not need to be notified. If the work is likely to cause significant break up and deterioration of the material such as large scale removal using steaming or gelling methods, then notification would be required. Asbestos essentials includes a number of task sheets which will show you how to safely carry out non-licensed work on textured coatings. Asbestos Insulating Board was commonly used as fireproofing material but it had many other uses such as ceiling tiles. It is difficult to tell the difference between asbestos insulating board ceiling tiles and non-asbestos materials. Work on any type of asbestos can be dangerous. However, some short duration work (less than 1 hour for 1 person in a 7 day period, not to exceed 2 hours spent by all workers) for small or minor tasks on AIB can be carried out by non-licensed workers who are appropriately trained. to finish, even if different tradespeople are sharing the work, needs a licensed asbestos contractor. No one tradesperson should work with AIB materials for more than one hour a week. Toilet seats and cisterns can contain asbestos reinforced materials. Wherever possible, remove in one piece without breaking up, so fibres cannot be released. Often found in halls and under stairs. 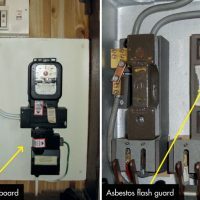 In old style fuse boxes each fuse wire may have an individual asbestos flash guard, and the back panel may also be asbestos insulating board (AIB). Gas and electricity meters may sit on an AIB shelf or be separated by an AIB partition. Usually white or grey in colour with a rough surface, although they may have been painted. This contains up to 85% asbestos and breaks up very easily. It is one of the most dangerous materials containing asbestos. Even minor disturbance of sprayed coatings can release large quantities of asbestos fibres into the air where they can be breathed in. It is difficult to tell the difference between asbestos insulating board partition wall items and non-asbestos materials. Work on any type of asbestos can be dangerous. However, some short duration work (less than 1 hour for 1 person in a 7 day period, not to exceed 2 hours spent by all workers) for small or minor tasks on AIB can be carried out by non-licensed workers who are appropriately trained. Short duration work to remove AIB as part of demolition or major refurbishment would be notifiable. Any work lasting more than 1 hour for 1 person in a 7 day period, or more than 2 hours by all workers would require a licensed contractor. Asbestos essentials includes a number of task sheets which will show you how to safely carry out non-licensed work on AIB. It is difficult to tell the difference between asbestos insulating board window panel items and non-asbestos materials. Work on any type of asbestos can be dangerous. However, some short duration work (less than 1 hour for 1 person in a 7 day period, not to exceed 2 hours spent by all workers) for small or minor tasks on AIB can be carried out by non-licensed workers who are appropriately trained. Short duration work to remove AIB as part of demolition or major refurbishment would be notifiable. Any work lasting more than 1 hour for 1 person in a 7 day period, or more than 2 hours by all workers would require a licensed contractor. Asbestos essentials includes a number of task sheets which will show you how to safely carry out non-licensed work on AIB. Asbestos can still be found in the form of boiler insulation in homes nationwide. 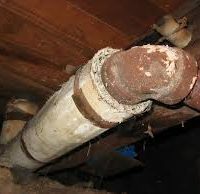 Asbestos was often used in insulation for boiler pipes to reduce energy costs and prevent fires. Asbestos insulation typically looks like corrugated cardboard and was wrapped around boiler pipes. 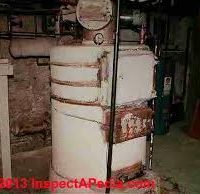 In older forms, asbestos boiler insulation could be found around a boiler’s stove, pipes, and doors. Typically, you’d find at least a 1-inch layer of asbestos concrete around a boiler. Asbestos floor tiles were once a popular choice for flooring, and you will often find old asbestos floor tiles hidden under carpets. Asbestos paper was often used for lining under floor tiles. These asbestos-containing materials are not very distinctive from what is used now. Work on any type of asbestos can be dangerous. However, tasks on these particular materials can be carried out by non-licensed workers who are appropriately trained. Work on these materials would not normally be notifiable provided that the material is in good condition. If the work is likely to cause significant break up and deterioration of the material then notification would be required. Asbestos essentials includes a number of task sheets which will show you how to safely carry out non-licensed work on these materials. Gas fires today employ various types of ceramic to achieve their realistic log effects. However, it wasn’t that long ago that many fake logs were actually fabricated from asbestos containing materials. If those old asbestos logs are chipped they could release asbestos dust particles into the air. Asbestos stove gaskets, sometimes called stove rope, were commonly used in wood burning stoves to seal them against air leaks. Asbestos insulation was often used in and around the fireplaces of older homes. This was due to the excellent fire suppression properties of asbestos. If asbestos containing insulation was used in your fireplace it may still be intact and therefore present no immediate danger. But if it is old and starting to break down you’ll want to have it removed as soon as possible. It’s advisable to hire a licensed asbestos removal expert for this job. Asbestos insulating boards used for fire protection, including as fireproofing panels in fire doors, walls, stairwells and lift shaft linings. 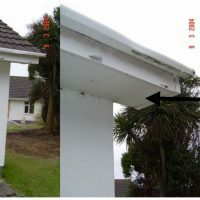 If you have grey coloured, concrete like guttering and down pipes, the chances are these are actually asbestos cement guttering and down pipes. It was very common, in the 1950’s to 1990’s, to use asbestos for guttering as it was a cheap and readily available material. If the guttering or down pipes are damaged or show signs of leaking, then it is advisable to consider replacing the asbestos material. Asbestos insulation board (AIB) is a relatively soft that can easily be confused with plasterboard or other sheet construction materials. Asbestos fibres can be released if AIB in soffits is significantly disturbed, perhaps when it is broken up, cut or drilled. As with all asbestos insulation board, AIB soffits must only be removed by licensed asbestos removal contractors taking suitable precautions. General contractors must not be engaged to undertake this work. Asbestos Insulating Board was commonly used as fireproofing material but it had many other uses such as exterior panels below windows. It is difficult to tell the difference between asbestos insulating board items and non-asbestos materials. Work on any type of asbestos can be dangerous. However, some short duration work (less than 1 hour for 1 person in a 7 day period, not to exceed 2 hours spent by all workers) for small or minor tasks on AIB can be carried out by non-licensed workers who are appropriately trained. Short duration work to remove AIB as part of demolition or major refurbishment would be notifiable. Any work lasting more than 1 hour for 1 person in a 7 day period, or more than 2 hours by all workers would require a licensed contractor. Asbestos essentials includes a number of task sheets which will show you how to safely carry out non-licensed work on AIB. Asbestos cement is a mixture of cement and asbestos. This is usually about 10-15% of the total product, forming a hard material. It is often used as corrugated roofing on sheds, garages and domestic outbuildings. Asbestos cement is a mixture of cement and asbestos. This is usually about 10-15% of the total product, forming a hard material. It is often used as corrugated roofing on sheds, garages and domestic outbuildings. This includes as wall panels as well as roof coverings. Asbestos roofing felt was often used for garage roofs, outbuildings etc. Work on any type of asbestos can be dangerous. However, tasks on these particular materials can be carried out by non-licensed workers who are appropriately trained. Work on roofing felt would not normally be notifiable provided that the material is in good condition. If the work is likely to cause significant break up and deterioration of the material then notification may be required. Asbestos essentials includes a number of task sheets which will show you how to safely carry out non-licensed work on these materials. If you think you may have an asbestos problem and are concerned you might not know the locations of asbestos, then call our Hampshire office on 023 9223 0700 or alternatively email us on enq@amiante.co.uk.